Who’s the grubbiest pirate on the high seas? Why, it’s Captain Beastlie, me hearties! He is a horror and embarrassment to his ship-shape crew. Captain Beastlie is eagerly counting down the days till his birthday – but what he doesn’t know is his crew has got a special secret lined up for the Big Event. 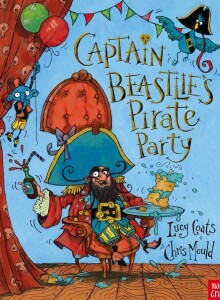 His days of being the smelliest, dirtiest pirate ever are numbered, and when Captain Beastlie’s birthday finally comes, he’s in for a big surprise, as his crew plans to steal his filthy old clothes, pop him in the bath and give him a brand new set of pirate togs at his birthday feast. This innocently revolting picture book will appeal particularly to boys fond of laughing at disgusting snot and bogey-related subjects. Think slugs and snails and puppy-dog tails with a dash of skull-and-crossbones. Parents will love it for the same reasons – plus it’s got a healthy dash of days of the week, counting, bath-time and humour! Well, first of all – pirates, obviously! Who doesn’t like pirates? I’ve always had a soft spot for them ever since I came across Captain Hook and his enemy the ticking crocodile in Peter Pan when I was a child. I wanted to write my own pirate captain, but he had to be the right one. Captain Beastlie had a long incubation period, and went through several incarnations. He started off as a pirate vampire, in about 1999, but I couldn’t get his story right so I put him away for a few years , and then of course, Justin Somper’s Vampirates arrived, and that meant vampires were out. Eventually, I got him out again, and realised who he was – the most disgusting pirate ever, with a crew who were always clearing up after him. Kids love to be messy, so I thought they’d probably relate to a character with absolutely no mess boundaries. When I was little my granny and I used to go on what she called ‘badger picnics’, where no manners were required. We threw food at each other, smeared jam all over our faces, rolled around in mud and generally got as filthy as we could. That memory was what I channelled when I was writing about peanut butter ear globs and smeary toast. Every time I get a disgusted groan of delight, or revolted ‘yuk’ at my Captain B’s disgustery, I give a mental cheer and a high five to my awesome granny! “Captain Beastlie is exactly the kind of character young children love to hate, or should that be, hate to love? Whichever it is, this rip-roaring story of the thoroughly unsavoury Captain (in stark contrast to his immaculate and spotless crew) and his hilariously disgusting doings in the week prior to his birthday, culminating in a nearly disastrous big day has certainly been a resounding hit at every early years setting I’ve visited in the past few weeks. Loud EUGGGHHs, YUCKS and interjections of GROSS! have been heard at each and every story session as well as frequent requests for re-readings. With such a bogey-picking and licking, pongy-socked, peanut butter globby-eared, fungal fingered, snifflingly whiffing, rotten shirted pirate what right minded child could resist his allure?